I’m so thrilled to have Tamarah, from Lighten-Up guest posting today. Tamarah’s sister, Deborah and I are good friends and in fact I think their entire family is quite wonderful, so when an opportunity came up to work together to spread a healthy message I knew I had to jump on it. I know that we are each trying to achieve happiness, balance and health in our lives, and I truly believe in this program and what it can offer each of you. Whether you win or not I hope you’ll choose to start growing, learning and changing through this wonderful program. Thank you to Sweet Basil and Carrian for this opportunity to giveaway 3 FREE $149.00 memberships to the Lighten-Up Online Weight Loss Program! McKenna Gordon (TotallyHealthyRecipes.com) and myself, Tamarah Bartmess (TheLightsomeLife.com) co-created this unique program because we saw the need for healthy weight loss principles to guide the way each woman views their body, food, mindset, environment and relationships. Each of these elements are main contributors to stress and unhealthy living choices. Both McKenna and I have had personal health & weight struggles which is why we have found that these are THE 5 KEY ELEMENTS to healthy living. When they are supported it brings positive and long term weight loss results. More importantly though, the program encourages healthy living, lasting changes and learning to love yourself again. Our program is for every woman that is tired of flash in the pan fad diets, who really struggles with her energy levels and is open to learning how to become the master of her own health and body. Drawing from the information of several hand-picked Experts, you will have the tools necessary to guide you on your weight loss journey. Lighten-Up is unique and different for it’s ability to reach across the world through the internet and create a movement to LIGHTEN-UP more than just the number on the scale. The Online Community is full of REAL women that are looking to give and receive support and encouragement from each other during their weight loss journey. It has been shown again and again that the accountability and support provided in our Private Online Community has become the #1 tool to moving through these healthy living & lifestyle shifts. It is the only Online Weight Loss Program that is so comprehensive and supportive in healthy living. All the digital materials including information that breaks down the 5 key elements of the Lighten-Up program. 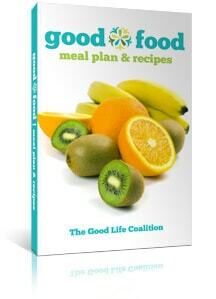 Healthy recipes & meal plans that are friendly to different food styles: Vegetarian, Vegan, Omnivore and Gluten-Free. 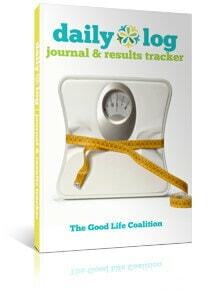 Of course you receive a unique daily journal and results tracker to help start creating healthy habits. 6 weeks worth of email content from our Lighten-Up Experts that will help support each woman in their holistic weight loss experience. After completing the 6 weeks each “graduate” receives our BONUS Swag Bag full of goodies from all our experts!The overall value of this program is well above $1000.00! 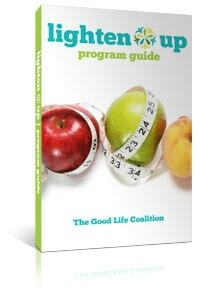 Come meet our experts and read more about the program when you visit us at The Good Life Coalition – Lighten-Up! Even if you don’t win the giveaway, for those that are really interested we want to give you a coupon for 40% off the entire program. BE-ING Healthy is important, and we want to support you in your journey! Just use the code SWEETBASIL40 at checkout. I guess this mean that I won!!! Thanks Carrian!! I love your blog and everything you are doing!! Cant wait to hear from you! !